Pedal puncture wounds can precipitate a variety of complications, often resulting from a delay in treatment. Although the risk of infection predominates, direct vascular insult and subsequent ischemia is a lesser reported complication of these injuries. Consequently, this may have morbid results, especially on a background of pre-existing peripheral vascular disease. We present a case involving a small, plantar forefoot puncture wound, ultimately resulting in transmetatarsal amputation due to ischemic gangrene in an uncontrolled, but sensate, diabetic with profound vasculopathy. This presentation highlights the importance of considering the potential for macrovascular damage via pedal puncture, and the potentially magnified complications in patients with dependent retrograde angiosomal flow and compromised collateral circulation. Based on a thorough analysis of the literature and the findings in this clinical example, we advocate a detailed investigation of angiosomal blood supply through direct and indirect vessel flow in patients with peripheral arterial disease incurring puncture wounds. In these patients, lack of compensatory avenues of the pedal circulation may portend significant tissue loss in an otherwise inoffensive situation. Knowledge of this complication, although rare, may prompt the clinician to assess for its potential, and emphasize a preference for direct revascularization in those with critical limb ischemia. Puncture wounds of the foot, although variable in presentation, share a common propensity for an unfavorable outcome if left untreated . These injuries can lead to cellulitis, abscess, osteomyelitis, foreign body retention, and even limb loss if neglected, as is common in the neuropathic patient. Being traumatic in nature, these wounds do not depend on neuropathy for their development, as in the mal perforans ulceration. Lavery et al., in their comparative work, used this concept to their advantage to illuminate the different outcomes between diabetic and non-diabetic patients, in a unique situation where these two populations are sustaining the same type of wound. They quantified that diabetics incurred significantly more osteomyelitis, more poly-microbial infections, and had a longer delay in presentation after sustaining a puncture wound than their non-diabetic counterparts . In a separate analysis of the same patients, the authors calculated a 46 times greater risk of amputation in the diabetic population . Given the difference in complications with a similar wound type, it is clear that in the diabetic host, immunologic dysfunction, vascular compromise, and malnutrition, among other comorbid conditions, can complicate what might otherwise be an innocuous situation. While infectious complications are usually of prime concern, we present a lesser described complication resulting from these injuries. We detail this patient’s course so the reader may be aware of this not immediately apparent complication. Our presentation is of a 60 year old Hispanic female who presented with her daughter to our emergency department for right foot pain secondary to a plantar hallucal puncture wound. They relayed to us that the injury was sustained approximately five days prior, after the patient stepped on a nail while wearing shoes. The nail was fully retrieved but they could not recall the condition of the nail. She was treated at an outside institution on the day of injury and prescribed cephalexin and trimethoprim/sulfamethoxazole oral antibiosis, but denied receiving any debridements or undergoing any advanced imaging. Tetanus prophylaxis had been administered according to the patient. She endorsed pain extending from the hallux to her dorsal forefoot where she had noticed developing bruising. She denied any drainage from the wound or systemic symptoms. Her past medical history was significant for diabetes mellitus, she denied however any neuropathic symptoms to the lower extremities or a history of pedal wounds. Her family endorsed the patient being a community ambulatory, but that she overall was not especially active. She denied any claudication symptoms. On examination. There was a small crust to the right 1st toe sulcus. Ecchymosis was noted dorsally over the 1st and 2nd metatarsal heads as well as to the medial hallux base (Figure 1a and b). Figure 1a: Patient’s foot at presentation. Modest erythema was present about the puncture wound. A well-defined area of ecchymosis is appreciated dorsally away from the site of nail entry in the rear part. Figure 1b: Patient’s foot at presentation. Modest erythema was present about the puncture wound. A well-defined area of ecchymosis is appreciated dorsally away from the site of nail entry in the front part. Mild serous drainage was evident. Modest erythema was appreciated about the wound. No fluctuance or crepitation was palpable. Her sensory exam with a 5.07 g monofilament was within normal limits. No gross deformities were present to her foot, and muscle strength was 5/5 to all key groups across the ankle. Her dorsalis pedis pulse was non-palpable, while her posterior tibial pulse was +1/4, and both were monophasic on exam with a handheld 4 megahertz vascular probe. After a Mayo block with 10 ml of 2% lidocaine plain, a bedside irrigation and drainage was performed with a #15 blade. 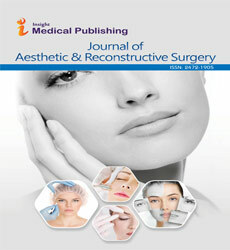 This revealed exposed subcutaneous tissue after the removal of the overlying crust. No deep probing was found, only mild tracking within the subcutaneous plane proximally, nor any evidence of gross contamination or retained foreign body. The wound was then irrigated with 1 liter of normal saline and deep aerobic and anaerobic cultures were obtained. No antiseptics or soaps were used with the irrigation so as to avoid any skin reactions that might be mistaken for cellulitis . A silver dressing was applied without compression, and she was instructed to heel weight bear only to the affected foot with a surgical shoe. Radiographically, there was no evidence of osseous involvement or radiopaque foreign material. Vital signs were stable. Her laboratory values demonstrated leukocytosis with a white blood cell count of 11.95 cells per cubic millimeter (71.2% neutrophils), C-reactive protein of 23.4 milligrams per deciliter, erythrocyte sedimentation rate of 69 millimeters per hour, and blood glucose of 211 milligrams per deciliter. In general, our protocol is to admit all diabetic patients with puncture wounds given the potential for untoward consequences even in the face of benign presentations. The internal medicine service admitted the patient for medical optimization, intravenous broad spectrum antibiotics, vascular work-up, and magnetic resonance imaging (MRI). Her MRI was both performed and promptly read the following day. There was no evidence of retained foreign material, abscess, or osteomyelitis. Despite her unremarkable imaging, her foot clinically deteriorated precipitously, and only 2 days later, her entire hallux was completely cyanotic, displaying a deep purple color and was cool to touch (Figure 2). Figure 2: Clinical appearance 2 days after presentation. The seemingly innocuous injury has progressed to ischemic changes encompassing her entire hallux as well as a portion of the dorsal foot proximal to the toe. The patient was counseled that she was at significant risk for a transmetatarsal amputation, even limb loss. We explained to her in detail that prior to any intervention, we would need for her soft tissues to demarcate to reveal a viable tissue margin, and her vascular workup to be complete, as long as no emergent infection developed that would require more prompt debridement. Non-invasive vascular studies were completed shortly thereafter and duplex doppler exam revealed right superficial femoral artery (SFA) and popliteal artery stenosis. The ABI was 0.64, with monophasic flow noted to the distal anterior tibial artery, peroneal artery, and distal posterior tibial artery. Approximately 1 week after her admission she underwent endovascular intervention in the form of right SFA and Popliteal laser atherectomy and bare metal stenting and right posterior tibial artery laser atherectomy. The anterior tibial artery ATA] was found to be occluded. There was no mention of attempts to recanalize this vessel. No description was given of the completeness of the pedal arch or reconstitution of the ATA distally by way of collaterals. The patient was discharged 3 days later. Her empiric antibiotic regimen of vancomycin and piperacillin/tazobactam was discontinued by the internal medicine team at the advice of the infectious disease service, as her foot no longer had any clinical signs of infection despite her emergency department cultures growing 3+ Bacillus cereus and 2+ Enterococcus species, both of which had tested susceptible to vancomycin. Her discoloration had remained similar in appearance with additional partial thickness skin loss to her dorsal forefoot. Her tissues remained supple and undemarcated. She was instructed continue to be non-weight bearing, which was best accomplished with a wheelchair after physical therapy examination. The patient was schedule for close clinic follow up with the anticipation of serial exams to await appropriate soft tissue demarcation for surgery. At her 2nd post discharge clinic visit, her tissues had clearly demarcated (Figure 3a and b). Figure 3a: Clinical appearance showing clear demarcation of the gangrenous changes in the front. Figure 3b: Clinical appearance showing clear demarcation of the gangrenous changes in the rear part. Her hallux was completely mummified, being wilted and hard to the touch. The dorsal tissues displayed partial thickness necrosis with sharply demarcated and rolled margins. The patient was unable to range her hallux actively. Given the appearance of the tissue, we counseled the patient that the timing for an amputation was appropriate. We discussed that depending on the depth of the dorsal forefoot necrosis, a partial 1st ray amputation with an acellular bilayer allograft and negative pressure wound therapy may be an option rather than an amputation at the transmetatarsal level. We discussed that a transmetatarsal amputation (TMA) would likely be more expeditious even if a partial 1st ray amputation was possible, but that with either amputation, there was no guarantee of healing given her peripheral vascular disease and diabetes. She agreed to present as an outpatient the following week for a partial 1st ray amputation versus TMA. The patient was taken to surgery approximately 1 week later. She was administered a 1st generation cephalosporin preoperatively and under mild sedation taken to the operative suite. She was positioned supine on the operating table with a bump placed under the ipsilateral hip to bring the foot into a neutral position. No tourniquet was used or applied for the case. General endotracheal anesthesia was obtained and a block of 10 ml 0.5% bupivacaine plain was administered about the right ankle for preemptive analgesia. A partial 1st ray amputation was performed through a medial incision that closely circumscribed the margin of the gangrenous tissue, so as to preserve a maximal amount viable tissue to cover the wound defect. The hallux was disarticulated at the metatarsophalangeal joint, and the 1st metatarsal shaft was exposed after removal of the more proximal necrotic tissue. The shaft was sectioned with a sagittal saw at the proximal diaphysis in a distal-medial-dorsal to plantar-proximal-lateral orientation to avoid sharp prominences. The metatarsal base was seen to be viable appearing with noted medullary bleeding, the cortices of good caliber, and without any signs of osteonecrosis or intraosseous purulence. The resected bone was sent to pathology as a permanent specimen for histologic examination. The remaining dorsal soft tissue necrosis was debrided and it was discovered that after debridement, there did remain a layer of viable, mildly bleeding tissue over the metatarsals. By no means was this layer robust, but it did appear salvageable. The extensor tendons were removed to clear the wound of any avascular tissue. No purulence or deep abscess was encountered during the case. Irrigation of the wound was performed with 3 liters of normal saline. Cultures were then obtained post irrigation from the remaining soft tissue defect. The deep tissues were approximated with a slowly absorbable synthetic suture so as to approximate the medial flap from her ray amputation to the more lateral tissues. A cellular bilayer allograft was applied and fenestrated, secured with a negative pressure therapy device set at 75 mmHg of suction. This setting is thought to be more appropriate in patients with critical limb ischemia than the traditional 125 mmHg, so as to promote angiogenesis within the wound rather than occlude the microcirculation . She emerged from anesthesia smoothly, and there were no apparent immediate operative or anesthetic complications. The patient was admitted postoperatively to obtain a home negative pressure device as this was thought to be essential to avoid a TMA given the tenuous nature of her wound. This was ultimately not obtained even with case management assistance given her insurance and county of residence. She was discharged with a bolster dressing and instructions to leave this in place while maintaining non-weight bearing to the operative extremity. She was discharged on doxycycline for prophylaxis as her enterococcus positive culture from the emergency department showed sensitivity to this. At the initial post-operative follow up, the surgical wound displayed evidence of deterioration, with non-viable tissue comprising the majority of her wound. Wound cultures obtained after surgical irrigation and debridement were again growing 3+ enterococcus. Still no signs of infection were present. Ultimately, based on these clinical findings and positive wound cultures, she was revised to a TMA on an outpatient basis 9 days later. The pre-procedural details were identical to her index procedure. The prior incision was extended to create a horizontal fish mouth incision with medial and lateral limbs centered over the respective metatarsals along the angiosomal borders. The dorsal tissue proximal to the wound was elevated in a single layer fashion to preserve vascularity. The flap was elevated approximately 2.5 cm proximal to the cut ends of the metatarsals given the dorsal extent of the non-viable tissue. 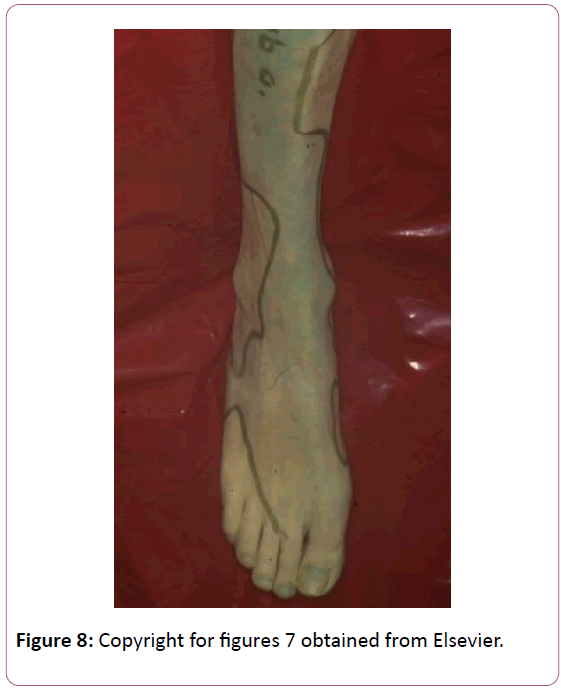 We thus relied on the long length of the plantar flap to obtain coverage at the amputation site. The metatarsals were sectioned from dorsal- distal to plantar-proximal to avoid any sharp prominences, the 2nd metatarsal was left slightly longer than the 1st, and each lesser metatarsal cut sequentially shorter from medial to lateral so as to maintain an anatomic metatarsal cascade (Figure 4). 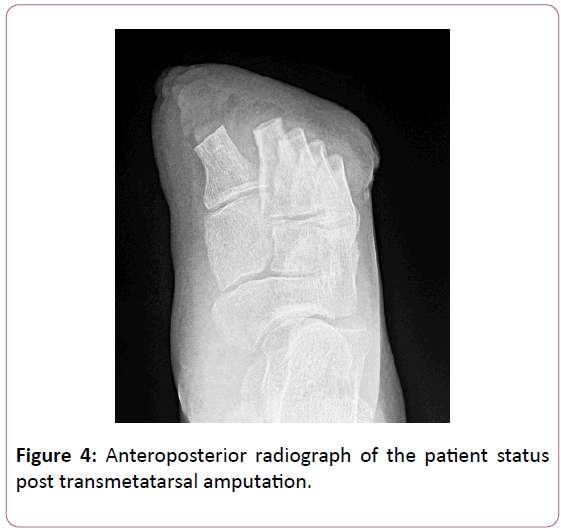 Figure 4: Anteroposterior radiograph of the patient status post transmetatarsal amputation. Again, no purulence was noted, and the metatarsal stumps were viable appearing and bleeding well. The forefoot was sent to pathology for histologic examination. The wound was irrigated with 3 liters of normal saline and post ash cultures obtained from the remaining soft tissue. 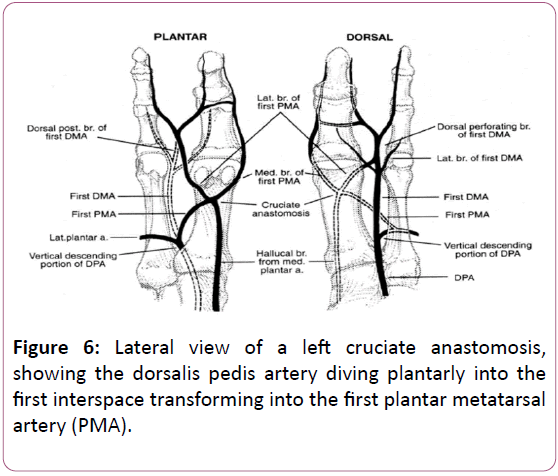 The amputation site was primarily closed along the majority of its length by rotating the plantar flap laterally and dorsally in the form of a rotational lateral plantar artery flap. There remained a small, granular wound dorsal to her 1st met base that could not be completely covered. No overt equinus was demonstrable, and so no posterior column lengthening was performed. A silver dressing was applied with minimal compression and she was discharged on doxycycline. She was emerged from anesthesia and ultimately discharged without incident. Osseous specimens from both procedures were viable without any signs of osteomyelitis as expected. The cultures from her TMA procedure were negative for any growth. Local wound care was performed for a dorsal medial wound that was not able to be covered with her rotational TMA flap. She ultimately healed successfully after a few months of wound care (Figure 5). 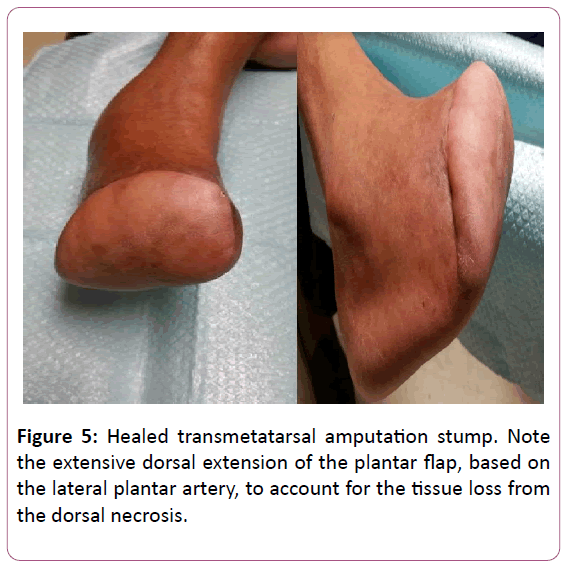 Figure 5: Healed transmetatarsal amputation stump. Note the extensive dorsal extension of the plantar flap, based on the lateral plantar artery, to account for the tissue loss from the dorsal necrosis. The protracted course of wound healing was expected and explained to the patient given it was in her deficient angiosome. The patient was not able to obtain diabetic shoe gear as it was cost prohibitive. She was unable to obtain insurance for assistance as she did not have a social security number. We fashioned her a plastizote insert and toe filler for her tennis shoe in clinic. Obtaining a custom molded insert was of lesser importance in this patient as she is sensate, although, of course, progression to neuropathy is a potential future sequela of her diabetes. At her most recent post-operative visit 12 months after injury, she reports she is gradually returning to her pre-injury activities, walking in the home and occasionally in the community with a gait assistive device. She has remained without wound or ulceration. The foot and ankle have been described as being comprised of 6 angiosomal territories, 3 dimensional blocks of tissue fed by source arteries . Attinger’s seminal work described that as the foot and ankle comprise an end organ, the arteries that constitute source angiosomal flow to the foot have a complex and intricate network of arterial-arterial connections that allow alternative routes of blood to develop if the primary route sustains insult . Specifically, the dorsalis pedis artery has connections from the medial plantar artery medially, from the calcaneal branch of the peroneal artery proximolaterally, and from the lateral plantar artery and its perforators distally . As our patient was found to have anterior tibial artery occlusion on her arteriogram, it is possible that her dorsalis pedis territory was being serviced by retrograde flow from her medial or lateral plantar artery, or possibly both. At the 1st metatarsal head, there is a confluence of branches of these vessels plantarly, forming the cruciate anastomosis (Figure 6) . Figure 6: Lateral view of a left cruciate anastomosis, showing the dorsalis pedis artery diving plantarly into the first interspace transforming into the first plantar metatarsal artery (PMA). The PMA combines with the hallucal branch of the medial plantar artery to form the proximal limb of the cruciate anastomosis which then terminates into the medial and lateral branches of the PMA, thus providing arterial blood supply to the hallux. FDMA – First Dorsal Metatarsal Artery. This anastomosis may have been directly injured by her puncture wound, or compressed from the resulting edema. Its connection to the dorsalis pedis angiosome is formed by way of anastomosis to the dorsal 1st metatarsal artery and one of its branches, the 1st dorsal digital artery. Depending upon the predominance of arteries constituting the cruciate anastomosis, the hallux may be primarily sustained by the lateral plantar artery, medial plantar artery, terminal braches of the dorsalis pedis artery, or a combination thereof (Figure 7) .Copyright for Figures 7 and 8 obtained from Elsevier (Figures 8 and 9). 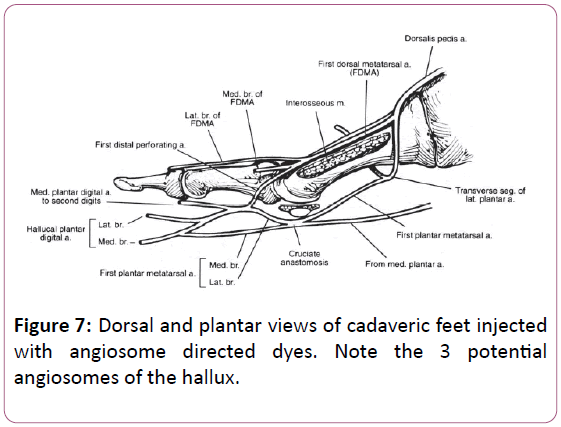 Figure 7: Dorsal and plantar views of cadaveric feet injected with angiosome directed dyes. Note the 3 potential angiosomes of the hallux. Figure 8: Copyright for figures 7 obtained from Elsevier. Figure 9: Copyright for figures 8 obtained from Elsevier. As the dorsalis pedis angiosome was compromised in this case due to anterior tibial artery occlusion, embarrassment of the vessels that were providing retrograde flow to the angiosome created a situation where there were no longer serviceable vessels substituting for the occluded source vessel, resulting in gangrene. Another connection of the dorsalis pedis and posterior tibial artery angiosomes is via the plantar arch of the lateral plantar artery (major branch of posterior tibial artery) connecting to the deep plantar artery, one of the terminal branches of the dorsalis pedis artery, which dives plantarly to meet the arch in the proximal 1st intermetatarsal space. Arguably, this anastomosis was not sufficient to maintain the medial forefoot arterial supply, or perhaps was occluded, or absent altogether. As illustrated in the clinical pictures provided, the proximal dorsalis pedis angiosome appears to have remained viable, and that the lesser toes and lateral forefoot were not gangrenous. As the vascular operative report did not describe the pedal arch and there were no angiography images of the foot itself, it is impossible to know the exact pattern of retrograde and/or collateral flow that was servicing the remainder of the dorsal foot. Depending on the level of occlusion of the anterior tibial artery, there could have been collateral reconstitution at some point that allowed arterial flow to the proximal portion of the dorsalis pedis artery. Regardless, it appears that the flow to hallux and to the medial aspect of the dorsal forefoot distal to the tarsometatarsal joint was completely dependent on the retrograde flow from the cruciate anastomosis that had been damaged by the puncture wound. The proximal foot likely remained viable due to the anastomosis between the medial planar artery and the dorsalis pedis artery by way of the medial tarsal artery. Another potential tributary to the dorsalis pedis is the lateral calcaneal artery (a terminal branch of the peroneal artery) by way of the lateral tarsal artery. Either scenario, or both, is conceivable given that there was 2 vessel runoff noted to the foot via the peroneal and posterior tibial arteries after angiography. The gangrenous changes appear to arc along the course of the arcuate artery, which certainly compromised antegrade flow to its branches of the dorsal metatarsal arteries. However, retrograde flow is provided to these arteries by the distal perforating arteries, supplied by the plantar metatarsal arteries that emanate from the lateral planar artery that connect the dorsal and plantar metatarsal arteries in the distal intermetatarsal space. This inter-angiosomal connection appears to have allowed the lesser toes to remain viable. Sequential and selective manual compression of the pedal vasculature and dopplering for antegrade or retrograde flow can elucidate, in part, the complex network of anastomoses within a specific foot. This has been detailed in Attinger’s work as a guide for incisional planning in the vascularly compromised foot . This may have mapped the specifics of our patient’s cruciate anastomosis, however this was not performed, and ultimately, would not have altered her course. Given the significant rate of amputation despite technically successfully revascularizations [8,9], as in our case, debate persists as to the efficacy of angiosome-based revascularization, the so called direct revascularization, versus indirect revascularization. In the angiosomal model of revascularization, the target vessel is chosen based on the anatomic distribution of the tissue loss rather than the “best” or least diseased vessel, which is the focus of indirect revascularization. In the latter scenario, the target vessel is then tasked to reach the affected angiosomes source vessel via collaterals, to then affect perfusion to the wanting tissue. A recent literature review out of the United Kingdom by Khor and Price identified 5 studies comparing direct versus indirect revascularization to affect wound healing in diabetic patients. Their rigorous criteria excluded acute limb ischemia as well as studies without wound healing as a target outcome. All 5 were retrospective in nature, currently the highest level of evidence addressing this topic. Their statistical analysis of these 280 patients revealed a nearly two-fold increase in wound healing probability during a 12 month period in the direct revascularization group. They cautioned however that given the limited quantity of data and the lack of prospective studies, no definite conclusions can be made. The authors do concede the potential ethical challenge to implementing such a study given that treatment must be driven by patient specific needs rather than research objective . This finding has been disputed by Azuma and associates who asserted that the angiosomal concept was unimportant in patients without ESRD; however this study included both diabetic and non-diabetic patients . Given that PVD differs in these two cohorts, the results may artificially boost the success rate for the non-diabetics in the indirect revascularization group. Most notably, the diabetic vasculature demonstrates sparse collaterals and is more distinctly infrapopliteal . These features make indirect revascularization less likely to succeed, and direct revascularization harder to achieve, respectively, in the diabetic host. Crucially, as all of the studies were retrospective, they are subject to selection bias. Applying this to the choice of revascularization, the source artery to the affected angiosome is often the most diseased, and thus difficult to remediate. In those instances where the disease precludes revascularization, the patient would then receive indirect revascularization. In this way, those patients identified as having received indirect revascularization would overall tend to have more severe disease, potentially meaning that their reduced success is merely reflecting the difference in preoperative disease compared to the direct revascularization group rather than actual procedural efficacy . No mention was made in our patient’s vascular operative note about attempts at intervention to the occluded anterior tibia artery. Regardless, it remained occluded, and in this instance, indirect revascularization was unsuccessful at preventing amputation, although it may have improved the viability of the amputation site. Given the uniform and functional nature of a TMA, coupled with the fact that primary closure would have been obtained at her index procedure, it could be argued that the patient would have been best treated with a TMA initially rather than attempting lesser ray preservation. Multiple studies have demonstrated the high risk of future ulceration and amputation after hallux and partial 1st ray amputations, thus questioning its benefit as compared to a TMA [13,14]. In our patient, given the fact that she was not profoundly neuropathic, we considered this point of lesser concern than a patient with a history of ulcerations. Furthermore, the patient, after a thorough discussion, elected for a more minimal amputation if possible. Given that after a partial 1st ray amputation, the aesthetic appearance is only that of one less toe, there was likely a psychological influence at play. Multiple classification schemes have been developed to stratify the severity of puncture wounds and guide treatment accordingly. In his classic study, Patzakis divided the plantar foot into 3 zones. Zone 1 extending from the metatarsal necks distally, zone 2 from the metatarsal necks to Chopart’s joint, and Zone 3 the remaining hind foot. He found that puncture wounds occurring in Zone 1 had a greater incidence of bone and joint involvement given the paucity of soft tissue coverage in this area. The authors recommended hospital admission for all deep puncture wounds in zone 1 even without signs of infection, and admission for all punctures to bone in zones 2 and 3 . Krych and Lavery created a scoring system for puncture wounds based on wound classification, age and depth, radiographic findings, and shoe gear worn. Pairing three ranges of scoring to recommended treatment algorithms, they hoped to create a more objective approach to treatment of these wounds . Resnick and Fallat developed their own scheme, with five tiers of treatment based on depth of both foreign body penetration and infection . From our case example, it is clear that peripheral vascular disease could complicate any score or stage from the aforementioned classifications, and could even lead to amputation in an otherwise low score or stage. Furthermore, with respect to the zones described by Patzakis, a more distal vascular injury, as in Zone 1 in our example, would be potentially more devastating given that collateral flow diminishes more distally in the foot. We would thus propose that vascular status factor into any algorithm for the physician treating these wounds, just as it would for a typical neuropathic ulceration. Puncture wounds are a common affliction in the diabetic patients that are wrought with complications. While these undue sequelae are generally thought to be related to infection, the clinician should be aware that even without frank abscess or osteomyelitis, amputation may become necessary due to vascular compromise. In our case study, the patient presented with only mild cellulitis and a small soft tissue defect. Although her presentation to us had been delayed 5 days and she was previously placed on antibiotics without pseudomonal coverage, it appeared that she had presented before any devastating complication had occurred. Despite the absence of deep or fulminant infection, her hallux and dorsal forefoot became gangrenous due to small vessel injury in the setting of long standing peripheral vascular disease. 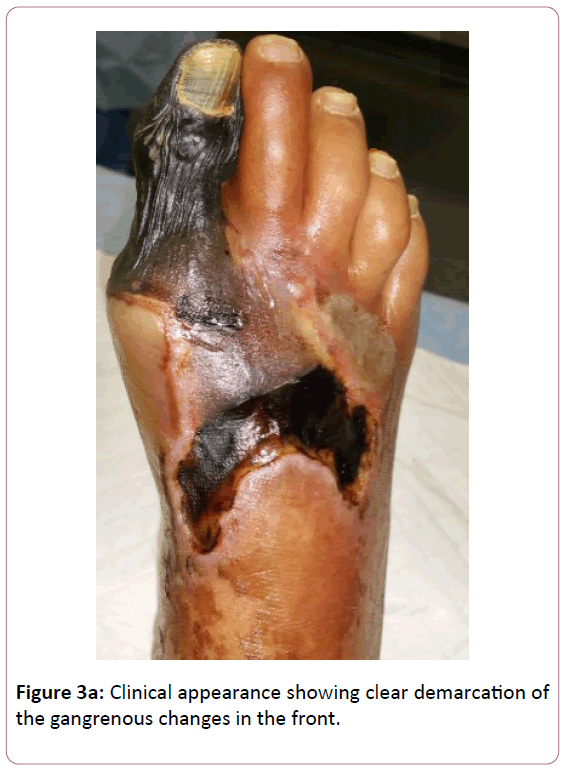 This illustration highlights the importance of treating all puncture wounds in the diabetic patient as limb threatening. We routinely admit all diabetic puncture wounds, regardless of presentation. This allows prompt measures to prevent or treat infection, namely intravenous antibiotic therapy and formal irrigation and debridement, as well as a thorough vascular workup and any necessary interventions. 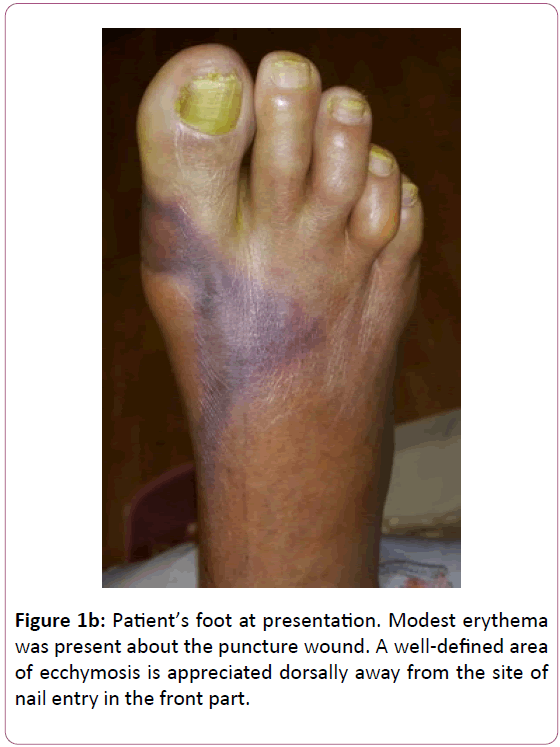 Peripheral vascular disease in the setting of a puncture wound is usually a contributor to a hostile wound healing environment, increasing the odds of an unsuccessful outcome. In this example however, we have demonstrated that the entity of PVD can be the primary factor necessitating amputation in a small puncture wound without serious infection. 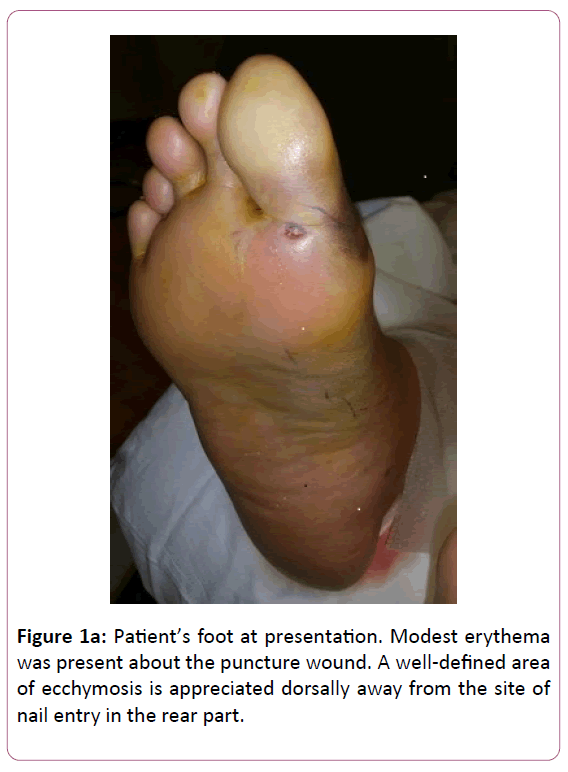 Racz R, Ramanujam C, Zgonis T (2010) Puncture Wounds of the Foot. Clinics in Podiatric Med Sur 27: 523-534. Laveries LA, Walker SC, Harkless LB (1995) Infected puncture wounds in diabetic and nondiabetic adults. Diabetes Care 18: 1588-1591. Armstrong DG, Lavery LA, Quebedeaux TL (1997) Surgical morbidity and the risk of amputation due to infected puncture wounds in diabetic versus nondiabetic adults. South Med J 90: 384. Corey SV, Butterworth ML (2012) Puncture Wounds. In McGlamry's Comprehensive Textbook of Foot and Ankle Surgery. Sibbald RG, Mahoney J (2003) A consensus report on the use of vacuum-assisted closure in chronic, difficult-to-heal wounds. Ostomy Wound Manage 49: 52-66. Taylor GI, Pan WR (1998) Angiosomes of the leg: anatomic study and clinical implications. Plast Reconstr Surg 102: 599-616. Attinger CE, Evans KK, Bulan E, Blume P, Cooper P (2006) Angiosomes of the foot and ankle and clinical implications for limb salvage: reconstruction, incisions, and revascularization. Plast Reconstr Surg 117: 261S-293S. Simons JP, Goodney PP, Nolan BW, Cronenwett JL, Messina LM, et al. (2010) Failure to achieve clinical improvement despite graft patency in patients undergoing infrainguinal lower extremity bypass for critical limb ischemia. J Vasc Surg 51: 1419-24. Khor BYC, Price P (2017) The comparative efficacy of angiosome-directed and indirect revascularization strategies to aid healing of chronic foot wounds in patients with co-morbid diabetes mellitus and critical limb ischaemia: a literature review. J Foot Ankle Res 10: 26. Azuma N, Uchida H, Kokubo T, Koya A, Akasaka N, et al. (2012) Factors influencing wound healing of critical ischaemic foot after bypass surgery: is the angiosome important in selecting bypass target artery? Eur J Vasc Endovasc Surg 43: 322-28. Thiruvoipati T, Kielhorn CE, Armstrong EJ (2015) Peripheral artery disease in patients with diabetes: Epidemiology, mechanisms, and outcomes. World J Diabetes 6: 961-9. Houlind K, Christensen J (2013) The Role of the Angiosome Model in Treatment of Critical Limb Ischemia. In Artery Bypass 24: 425-436. Murdoch DP, Armstrong DG, Dacus JB, Laughlin TJ, Morgan CB, et al. (1997) The natural history of great toe amputations. J Foot Ankle Surg 36: 204-8. Borkosky SL, Roukis TS (2012) Incidence of re-amputation following partial first ray amputation associated with diabetes mellitus and peripheral sensory neuropathy: a systematic review. Diabet Foot Ankle. Patzakis MJ, Wilkins J, Brien WW (1989) Wound site as predictor of complications following deep nail punctures of the foot. West J Med 150: 545-547. Krych SM, Lavery LA (1990) Puncture wounds and foreign body reactions. Clin Podiatr Med Surg 7: 725-731. Resnick CD, Fallat LM (1990) Puncture wounds: therapeutic considerations and a new classification. J Foot Surg. 29: 147-153.